Here are a couple of Halloween pics of Logan. 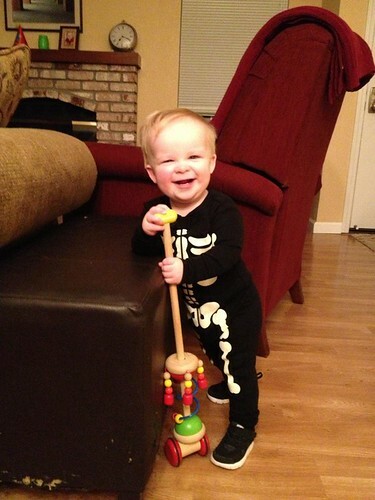 I sent him to daycare this morning in skeleton PJs. This is not his real costume… I just don’t want him to ruin the real one while eating lunch today. 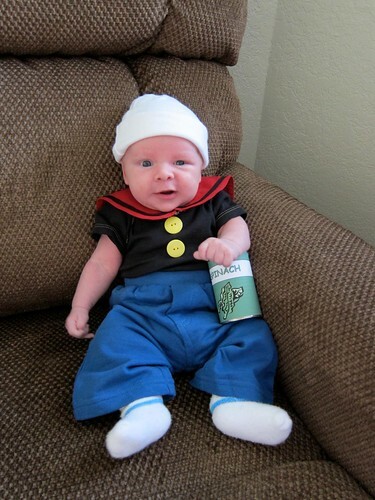 And just for fun, in case you missed it last year… I made him a Popeye costume. He was just under 4 weeks old in this pic (taken a few weeks before Halloween). Other than the little party in the daycare at work, we don’t have any plans this Halloween. I am not going to take Logan door-to-door begging for candy he obviously won’t eat. Though trust me, I wish I could! ;D We’ll have to wait for next year for that.